Slow cooker soup is one of the simplest weeknight dinner solutions around! 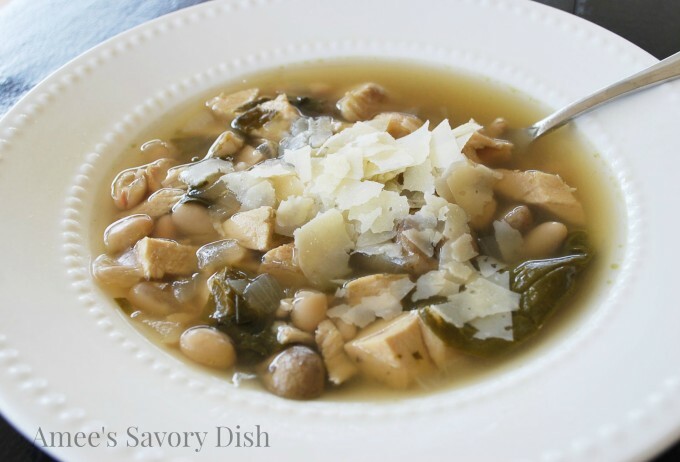 This crock pot chicken soup recipe combines chicken, spinach, and white beans to create a comforting, flavorful meal. I come up with some of my favorite recipes on the fly, throwing together things that need to be used up in the refrigerator. Also, I haven’t had a lot of time to cook lately, so the slow cooker becomes my best friend. 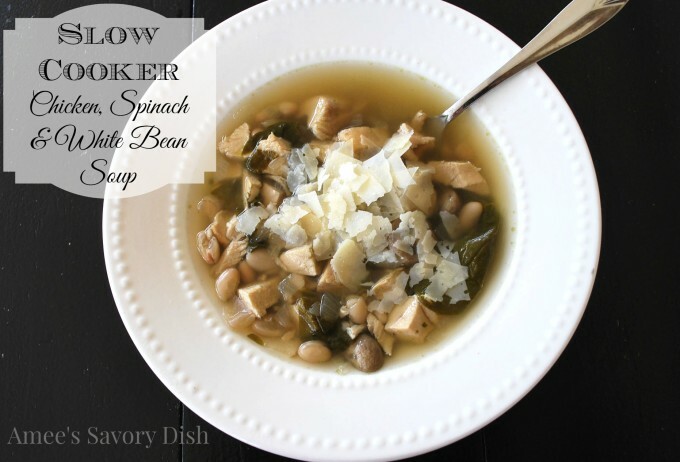 This chicken, spinach and bean slow cooker soup recipe makes a nutritious and tasty comfort meal. You just cannot beat throwing everything into a pot and coming home to a great dinner. Serve the slow cooker soup with a healthy salad and some warm dinner rolls! Here are more fabulous slow cooker recipes from my Sunday Supper friends! Sounds terrific! Pinning to my “recipes to try” board! I like what you threw into the pot to make this soup. I think spinach is a wonderful addition to just about any savory dish. So easy, so healthy, but most important, SO delicious! Perfect soup for a chilly day! So easy and with ingredients we love. Thanks for a great idea, seems I always have left over spinach in one of those big clam shells. Love the simplicity of this soup. It looks wonderful! Yep this is how I have come up with some of my favorite recipes. Thank you for stopping by Arlene! I love the color of this soup so light and beautiful. Great pairing of flavors!! Impromptu meals are some of my fave, Amee! I think this one looks like a winner. What a delicious option for my crockpot. I love the combination of chicken, spinach, mushrooms, beans and onions. These are a few of my favorite things!! You crack me up Betsy! Thank you!! This is definitely something that I would absolutely love. Amee, this soup looks elegant and sounds delicious. No one would know how easy it is by looking at your photos. Love the fresh Parmesan on top! Pinned, I love chicken and beans! I come up with my best recipes on the fly like that, if I over think it I run into problems! This sounds really good! This sounds so good! I love all of the ingredients!